A CVS Pharmacy® Gift Card is always a great choice. 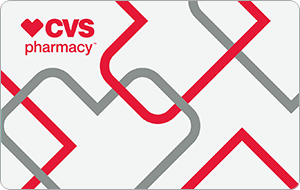 With more than 7,100 locations from coast to coast, CVS Pharmacy® is the most convenient place to get the prescription medications and health care products you need. Plus, it provides a huge selection of popular beauty and personal care brands as well as exclusive brands you won’t find anywhere else. It can be used at any CVS Pharmacy® location and can even be used toward prescription purchases+. +Restrictions apply. CVS Pharmacy® Gift Cards cannot be used online at CVS.com or for any other retailer’s Gift Card or prepaid card that CVS Pharmacy® may carry.